This product requires the base game Child of Light. 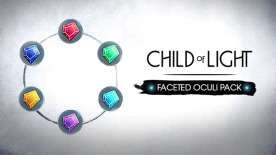 The Faceted Oculi Pack includes 6 faceted oculi for crafting: 2 red, 2 blue, 2 green. © 2014 Ubisoft Entertainment. All Rights Reserved. Child of Light, Uplay, Ubisoft, and the Ubisoft logo are trademarks of Ubisoft Entertainment in the US and/or other countries. Child of Light (Uplay) is required to play this DLC.